Oral surgery can be a stressful experience, but it does not need to be. Here at Mainland Dental Associates, we want our patients to rest assured when it comes to the safety and efficiency of their dental implant placement procedure. If you choose to use our practice for your treatment, we want you to know that your placement will be as quick, painless, and comfortable as possible. 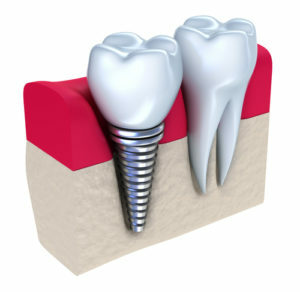 Continue reading to learn some of the basic details about dental implant placement. The very first step after you make your decision to get dental implants, is to schedule an appointment for a comprehensive evaluation. During this appointment, your mouth, teeth, and jaw will be examined, as well as your medical and dental history. You will then have x-rays and a CBCT scan taken in our office which will allow us to evaluate your jawbone density and ensure your best plan for success. The second step will be performed in our office with local anesthesia to help ensure a comfortable and pain-free experience. Once you are sufficiently comfortable, a small incision will be made in your gum tissue and the fixture or root piece will be attached to your jawbone. When this is complete, you will be sent home to heal while your jawbone fuses to the implant root. Once gum tissues and the jawbone have healed, patients return to have a middle piece called an abutment attached. This sometimes requires a small incision if gum tissues have grown over the fixture piece. If that happens, a bit more healing time will be required. Step three is also important because the new replacement tooth is crafted during this stage to perfectly match the color, shape, size, and texture of your natural teeth. The last step involves carefully attaching your new tooth to the dental implant fixture that was previously attached to your jawbone. Here at Mainland Dental Associates, we also offer Prettau Zirconia Bridges that can provide some of the most natural and functional results possible. Once this final step is complete, your new smile will be ready to show off. The answer to this question depends on the patient’s dental health. If bone or gum tissues are in poor health, extra procedures like grafting of gum or bone may be required to strengthen your jaw and ensure the best possible chance of implant success. Although they are necessary, supplemental procedures can add up to 6 months to the total procedure healing time. Now that you have a better idea of the placement process, why not take a look at supplemental procedures that can help you better prepare for dental implants? These procedures are often the first step in getting you ready for your new smile. If you have missing teeth and live in the Pleasantville, NJ area, we can’t wait to help you restore your smile with functional and natural-looking dental implants.